Home Our Garage Door Services Garage Door Maintenance Is Your Garage Door Safe to Use? Garage doors are an integral part of many American households, especially in Florida. When something goes wrong, this can be a massive inconvenience. 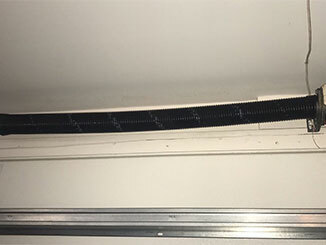 Nevertheless, it's important to be aware that handling a garage door system can present a number of hazards if you're untrained. While some maintenance tasks are fine to carry out yourself, you should always call in a professional when a more involved repair is required. The simplest way to maintain your garage door is to inspect its condition at least once a month. This will help you to notice if any area is deteriorating in particular and is likely to need servicing in the near future. In our experience, it's common for people to overlook components like the springs and brackets - but these can emerge as serious problem areas if uninspected for a long time. The brackets can be found at the bottom corners of the door - you should check these components for any noticeable wear or corrosion. Your springs may be of the torsion or extension type - whichever type they are, if they become broken or disconnected, they'll go flying off the mounts, becoming dangerous for you and your family. If during your weekly/monthly observation you see any problem with brackets and springs, get this addressed immediately. All sensors today should come both with a reversal mechanism and safety sensors designed to prompt your door to reverse when something is in its path. This is an absolutely essential function when it comes to your safety - you should double check this is working as it should be on a regular basis. All you need to do is place a broom in the path of the door and trigger it to close - if it continues to come all the way down, this indicates a problem which should be looked at. Why wait? If it's been a while since you checked the condition of your system, there's no time like the present! If you notice something that needs to be repaired or replaced, our local team at Garage Door Repair Fernandina Beach are on hand to help - just give us a call today to arrange an appointment!